AUTEUR ARIEL: Samson is such a poser. Samson is such a poser. My dog is a deceiving little poser. How is he a poser you ask? The other day when Connor was out running errands, I sat on the couch and worked/watched Netflix. The entire time Samson slept on the opposite end of the couch. The moment Connor walks through the door, Samson gets up, sprints over to me and flops on my lap. As if he didn't want to be caught by Connor not cuddling with me. AS IF HE ONLY CUDDLES WITH ME FOR SHOW. And guess what. He did it AGAIN but this time to Connor. Last night I came home from the gym and instantly Samson hops up onto the couch and curls up next to Connor and get this: stares me down. As if he was making me sure I acknowledged that he was cuddling with Connor. But I still love him to death. On an unrelated note (well actually, it is related to my pictures I posted today), if you live in Utah, you NEED to check out Madison and Sixth! They have locations in the Provo Towne Centre, Layton Hills Mall, and Fashion Place Mall. The jacket, dress, and beanie I'm wearing today are all from there and it's the cutest little shop around! I may or may not have this beanie in multiple colors (that's how much I love it). I had the sweet opportunity to model some outfits for them so you'll be seeing more from Madison and Sixth on my blog real soon! Have a totes awesome Thursday everyone. 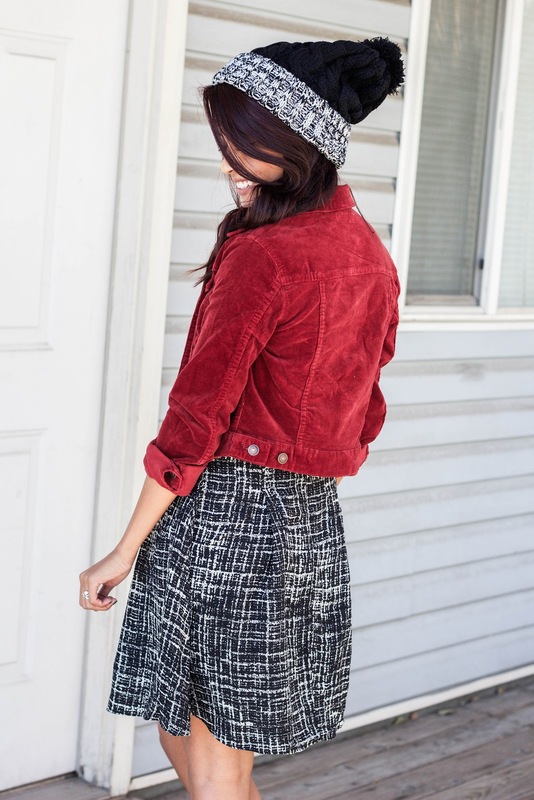 What a cool velvet jacket! The colour is amazing! hahaha that's so funny about your puppy! i've heard of madison and sixth! i'll have to check it out. Awesome outfit! I love how the hat and dress work together! the story about your dog tho... hhaha totally made my day!